We planned to spend the day at Yercaud. 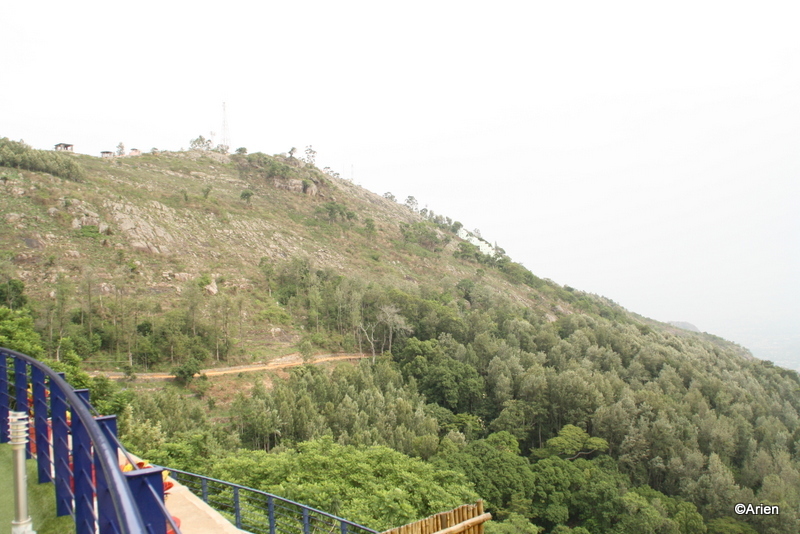 Because we had visited Yercaud before, we had an idea of the sigh-seeing spots to visit that day. 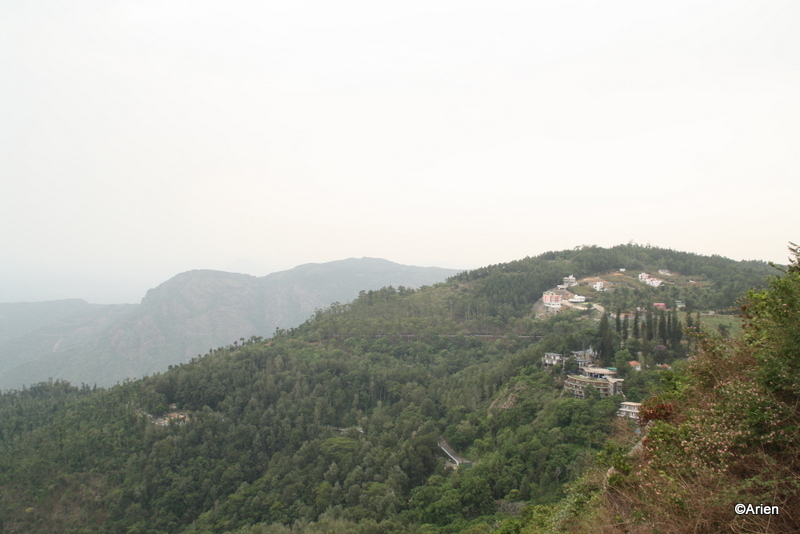 You can read about my earlier Yercaud visit, here and here. We visited the Yercaud Zoo, which is nowhere similar to or even close to the Mysore zoo. 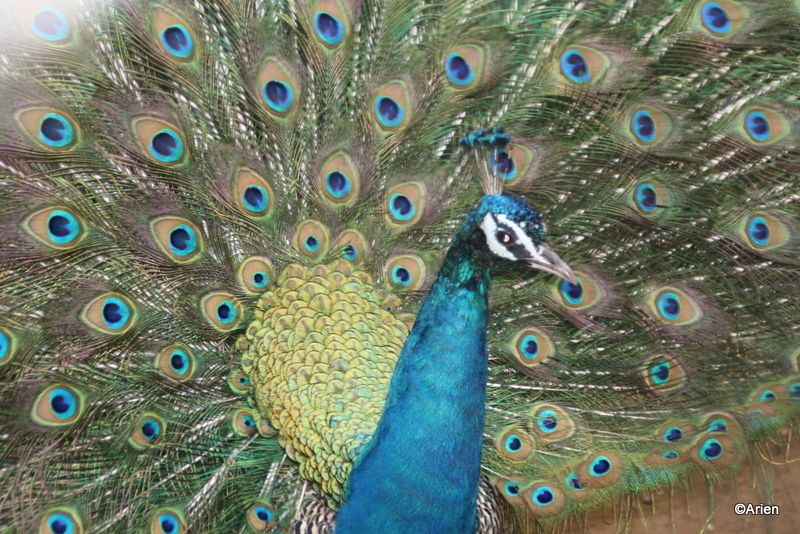 You can almost see why they say “Proud as a peacock” – the peacock is preening away for the shutterbugs. The zoo was quite crowded and after a few pictures, we were ready to leave. 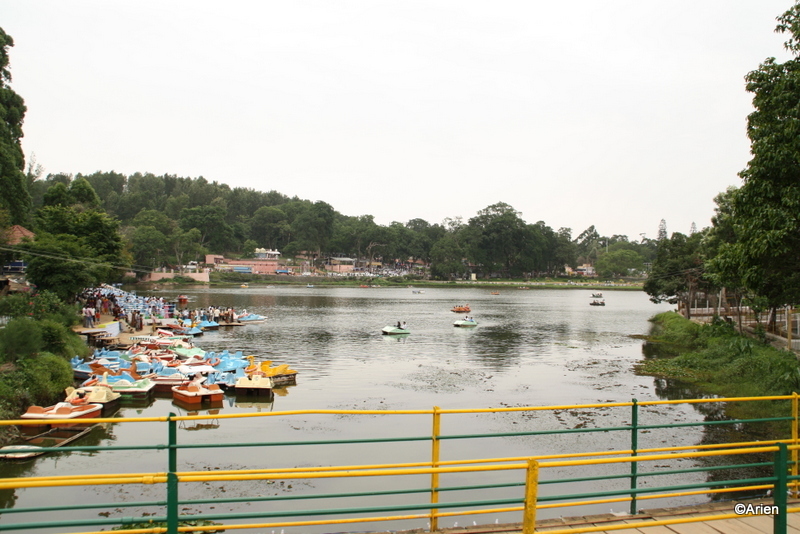 The next stop was the Yercaud boating place. None of us wanted to go boating in the sweltering heat and so we had Chai (again).The Arien want off to shoot more pics. None of the others look all that great and so I am posting only this pic. The last time also we did not go boating. In fact, we hired cycles to visit the Ladies Seat, Gents seat etc. This time, we took the car and visited the same sight-seeing spots. The plan was to have lunch at GRT Sky Rocca. This is a picture of the hotel from one of the seats. I am not sure if it is the Ladies Seat or the Kids seat. The climb was not steep but we were out of breath! It was windy and quite cold and we posed for some pics. Of course, we were giving our best smiles but the wind wreaked havoc on our hair. I am either turning away from the Camera or I am trying to hand comb my hair. Blah!! Its a distant shot and I doubt you can even make out the hotel in that pic. But, I am sure you can appreciate the height that we were at. All the climbing made us ravenous. We were ready to eat at Sky Rocca. The place was exactly as we remembered it. The food was somewhere in between good and ok. The Taurean enjoyed the respite from the crazy sight-seeing folks we tend to be when we travel. The senior Arien was tired and would have ideally liked to sleep after lunch but we were not finished yet. We spent some time at Sky Rocca, enjoying the view and both the Arien and self shared stories of what we did last time we stayed here. The Arien went off to shoot pics — his favorite hobby during our holidays. And then, we were off again. This time we were visiting a cave temple. I opted out of it because there were a gazillion folks already inside and very few were heading out. Both myself and the senior Arien stayed outside while the Arien and the Taurean went inside. There was a “santhe” or “jaathre” happening outside with a lot of balloons, giant wheels, ice-cream vendors, etc. which was quite colorful to watch. After the Arien and Taurean came out, I asked them to check if their wallets were with them. I sound paranoid, I know, but it happens so often. Crowded places and men losing their wallets go hand-in-hand. Luckily, their wallets and the money in it was safe. The Arien caught sight of a lil boy blowing bubbles and wanted to shoot some pics. We were all ready to leave but I knew that he would not leave until he got a few shots and so we gave him company. 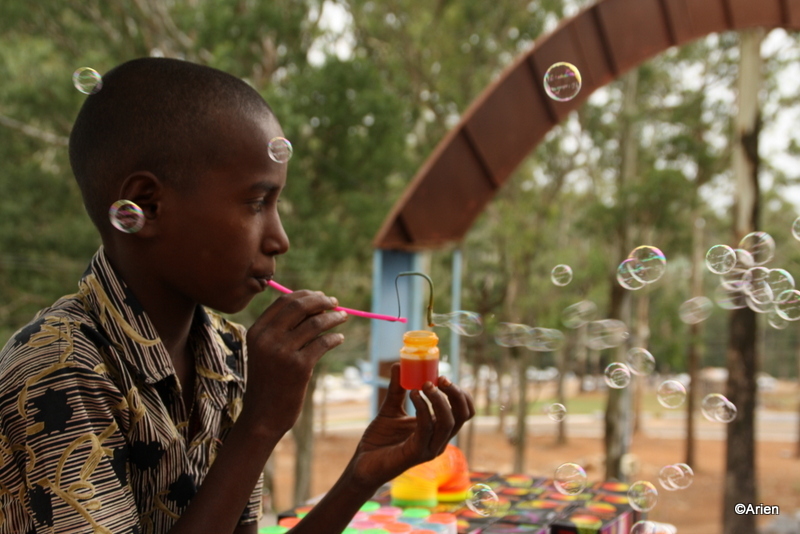 Of course, the model, our boy with the bubbles happily complied. He even refused to look our way though he knew we were shooting his pic. The last stop for the day was the Montfort school. This time we did not go in but I wanted a snap of the school for my blog so the Arien took one snap of the symbol alone. I told him that I will not be able to figure out anything from this snap and then he took another one. I finally did not even use it for my post at all :O I opted to use the fruit stack instead. Happens all the time with me. No wonder the Arien refuses to humor me. Maybe I will include it just for that. It was tea-time and everyone was a lil crabby, including me. A holiday usually involves a siesta, and we had not had ours today and so it was but natural. We stopped at a local sight-seeing spot and had Chai. We were ready to head back to our rooms and retire for the night. All of us were unanimous in our decision that we would not eat dinner at the hotel and so we drove like crazy until the Taurean spied A2B (Adyar Ananada Bhavan) and then we had a yummy dinner of tasty snacks. Considering we had had an amazing lunch, we were totally ok to finish dinner with a couple of snacks. We also decided to have our other meals at this place. The Arien looked poised to disagree and I jumped in with a “Can we decide on that later?” and so after a real touristy day, it was time to call it a day! Oh.. let me not forget the Montfort pic. There you go!